When I'm playing tech support specialist, I find that among the trickier problems to diagnose are connectivity issues. That's because I can't remote access the machine to see what's going on, in the first place. To help cope with this - I found this handy utility that among other things, contains a "Troubleshoot" button which goes through a complete set of checks of your connectivity. While the program's graphics are somewhat crude, the no installation needed -- just double click on the icon to run it approach, more than makes up for those shortcomings. Most importantly, the set of checks it goes through seem fairly complete. 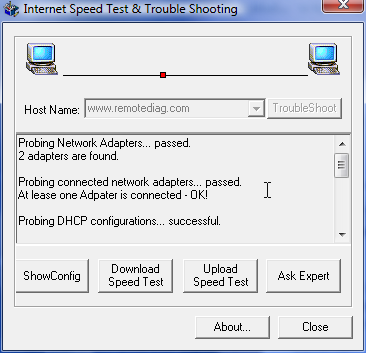 I think it's probably a good idea to be proactive with this tool - get a snapshot of the troubleshooting information before the connection is broken, that way you can see what should and shouldn't be working. The only suggestion I'd make to make the app better would be to add a big 'ol "Copy To Clipboard" button so that novices can easily get you the diagnostic output. Still, what do you want for free? I tested my internet connection speed by using the http://www.ip-details.com/.